Subscribe or follow Kanelstrand via Google Friend Connect to get updates on more eco DIY projects. With the following projects you will not only indulge your passion for sewing but you will be eco-friendly because most of them rely on reusing, repurposing and upcycling. Happy sewing! WoW I want to try all of these things! I think my next investment may be a sewing machine! I really like the Tohoku Tote - so pretty! 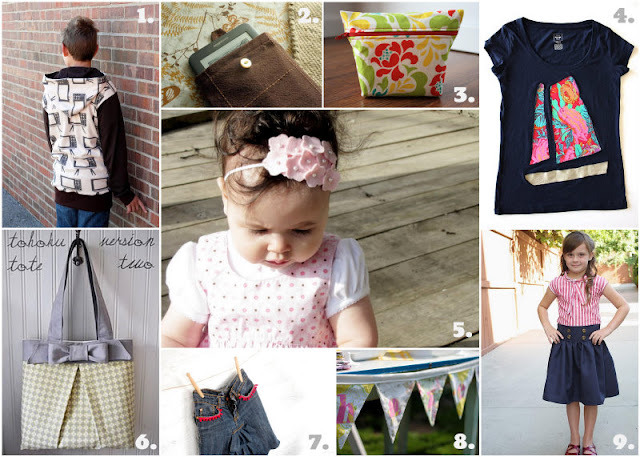 They all look fun to sew! I love the makeup bag and the tote the best! Thanks for the invitation to follow you (on the Etsy Blogging Bloggers site!) Would like to invite you to visit www.ColdhamCuddliescalling.blogspot.com, where I write about how I make, mend and otherwise create my toys which can also be seen at www.coldhamcuddlies.etsy.com. Look forward to seeing you! Am about to follow you now! Forgot to say - I, too, love sewing projects - and try to reuse stuff as much as possible. Some of my Bears are made with offcuts form a local upholstery factory, for example. These are great finds! The ideas for sewing up a project are seemingly endless. Or maybe it just seems that way to me because I love to sew! Lots of cool fun projects this week. I really link the Kindle case. I love every one of these projects! That little girl's skirt is too cute. I need to dust off my sewing machine and see if it still works and I still know how to use it. ;) I have my grandmother's old sewing machine that's many many years old!